If you have already registered for the Wine Tourism Conference 2015 then good for you!! Check out the blog post below from our partners and Loudoun experts at @VisitLoudoun to get some insider info on what will make your visit to the WTC15 conference even better! Of course, if you have not yet registered….then you need to hop to it and get in the groove of what is going to be a great learning opportunity and loads of fun! With more than 250 wineries throughout the state, Virginia is the fifth largest wine region in the country and with over 40 wineries in Loudoun, the Wine Tourism Conference is the perfect place to experience Virginia wine. During the conference you’ll have the chance to taste Loudoun and Virginia wine and visit one of Loudoun’s largest wineries, Stone Tower, which is just outside Leesburg and recently opened a new tasting room overlooking the mountains. While in town, be sure to try some of our famous Virginia varietals like Viognier or Norton. Virginians have been producing wine for over 400 years but now the craft beer scene is making waves across the state. Loudoun is home to 15 craft breweries and the new LoCo Ale Trail . Take a break from vino while in town to sample small batch, hand-crafted local brews and learn more about the industry during the Craft Beer Marketing workshop. Throughout the Wine Tourism Conference, learn from wine professionals from around the world, including Australia, China and Spain. Attend the Keynote Address to hear Sally Cope share her success story as the Executive Officer of Ultimate Winery Experiences working with Tourism Australia. Learn about China’s interest in wine tourism from President and Chairman of California-China Wine Trading, Christopher Beros and about the successes and challenges of wine tourism in Chile, Spain, Portugal, and even Slovenia. 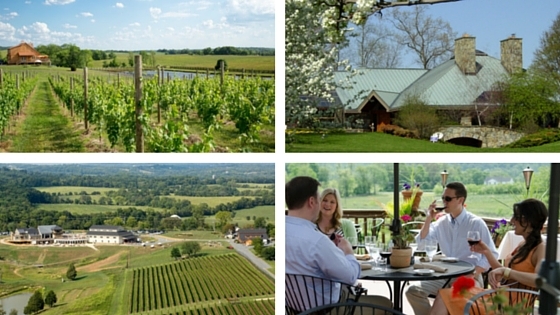 Kick off the Wine Tourism Conference at some of Loudoun’s boutique wineries! Register for the pre-conference winery tour to meet winemakers crafting award-winning wines and enjoy vintage Virginia views of vineyards set amidst rolling hills and scenic vistas at Fabbioli Cellars, Winery 32 and Tarara Winery. From farm-to-table and gourmet meals to hometown eats and local hotspots, Loudoun’s culinary scene offers something unique. Our Local Favorites list features popular barbecue, burger and pizza joints and our Destination Restaurant program highlights locally grown products and unique experiences that range from eating in a restored mill to dining under the stars in a glass conservatory on a farm. In addition, the conference includes two lunches and one dinner and we have an optional dinner on Friday evening. Loudoun isn’t just for wine and beer lovers, there are a growing number of cideries and distilleries that now call it home. Enjoy internationally recognized spirits at Catoctin Creek Distillery, which is powered by solar panels and is Loudoun’s first distillery since prohibition, or visit Virginia’s smallest ABC store at Mt. Defiance Distillery in Middleburg, the heart of Virginia hunt country. The main reason for having a Wine Tourism Conference is for those in the industry to learn and grow together as wine and marketing professionals. Attending this conference gives you the opportunity to learn about digital marketing, management, agricultural tourism, technology and so much more. Don’t miss this opportunity to network with winemakers, tasting room staff and tourism professionals at the beautiful Lansdowne Resort. You’ll learn just as much outside of the sessions as you will in the classroom! For more information on Loudoun, visit www.visitloudoun.org. We look forward to welcoming you in a few weeks! While I live near where this is all going n, I’ll be following your goings-on from over 10 time zones away. Give me tips please on how to follow along. The best avenues to follow along if you can’t make it are to put your email address in the Stay Updated box so you get alerts when we published news, follow #WTC15 on Twitter, and (if you are an alumnus) join our Alumni Facebook Group.